Home > Tips > Why Does My Cat’s Breath Smell Like Fish ? Your cat just yawned in your face and now you suddenly have an urge to die ? As if while you were not here, your cat had eaten a dead fish? As a reward for being a good parent, he decided to thank you by breathing this warm and fishy smell on your face. If you give your cat too much “human food“, there is a chance that tartar (yellow brownish deposit) will build up on his little teeth. Dental plaque is formed on your cat’s teeth by accumulation of bacteria. It is the main reason why cats (and humans) have bad breath. 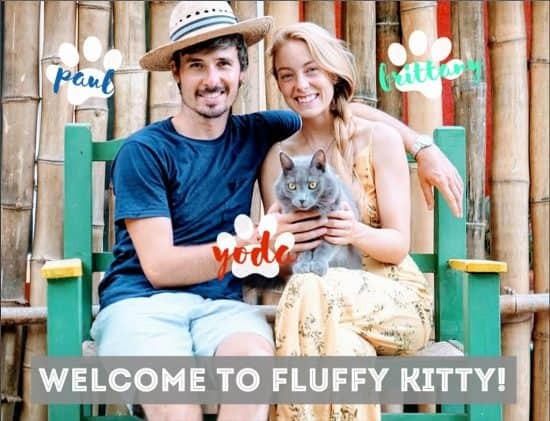 Just be careful what you feed your cat with and do not worry too much if after a good nap your cat’s breath is worse than hell, it could get better (see our recommendations later on this page). 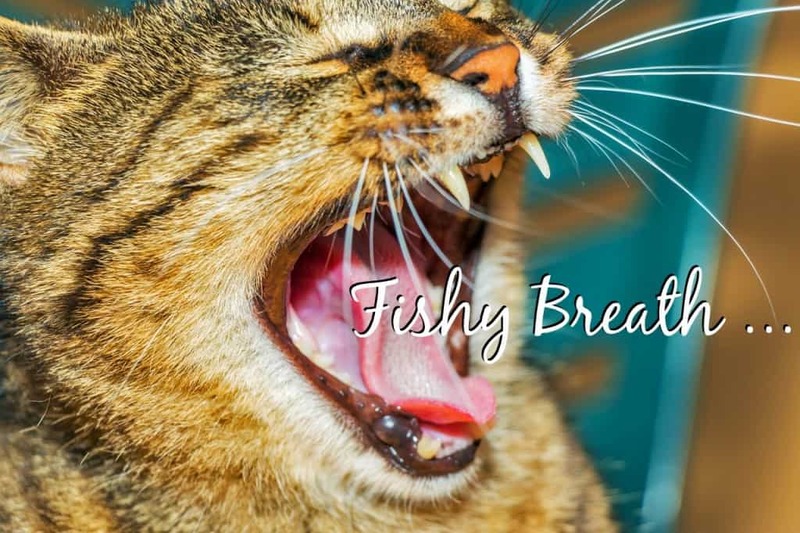 If your cat’s bad fishy breath is really strong and has been lasting for a while, chances are that he has a problem. It could be pharyngitis, gastritis or even a kidney failure… It could also indicate mouth disease. Do not wait and go see your local veterinarian as soon as possible, he will be the one able to identify what’s wrong and fix it. You could use a human toothbrush but it’s not as efficient. On the other side we do not recommend to use human tooth paste, it could harm the beast and nobody wants that! As for anything, if you want your cat to accept and get used to having his teeth brushed, it’s better to start early. As for the frequency, 2 times a week should do the trick. Kibble is one of the best options as it’s designed to fight tartar and plaque by making our little friend chew longer before he can swallow his food. Any kind of kibble is better than wet food for this purpose but you can find kibble that is made specifically to fight against tartar. Similarly, dental chews can be very useful to guarantee healthy teeth for your cat. Using the natural chewing action to wipe away tartar! PlaqueOff is a product specifically designed to fight tartar, plaque and bad breath. Just put the powder in your cat’s food. We only suggest this because some kitties wont let you brush their teeth that easily. This powder is an easier way to fight against the stinky breath. Well this one might not be as easy to pull off! Your vet could try to clean your cat’s teeth and take off the tartar but you know kitty won’t be happy about that. It’s probably the most efficient way and that’s maybe why it’s the hardest. Final Thoughts: Why Does My Cat’s Breath Smell Like Fish ? If you think about it, the main reason cats have bad breath is the same than for us. If you don’t clean that little mouth, bacteria will build up and create this naaaasty breath. Even if it is less likely, be sure to check that there is not any other problems for your cat and treat him with a little check up at the vet as it could be more serious than you think. What Is the Best Fish Oil for Cats? Can Cats Eat Sardines ? Find Out Meow! Every cat I have owned and every other cat I know has fish breath. There is not a cat I have met that doesn’t. I give my cats tartar treats and have their teeth cleaned it is still fishy. That’s just a cats breath. Or is it? Tuna for thought. Thanks for your comment 🙂 Sorry to hear your ChiChi is not having the freshest of breath! It’s great you went to your vet to check, and luckily the results are showing that there’s nothing bad coming from the inside. What’s your cat’s teeth like? It could just be a build up of tartar.. Yoda has some on his front canine tooth that I’ve been trying to scrub off but he is getting stubborn so I will need to take him to the vet for a routine teeth cleaning (then he really won’t be happy lol). Otherwise, what food are you using? The food could be causing this bad breath, and once when we had to use cat food from Nepal, his breath became unbearable. It was because the quality was bad, so we started making his own food and it improved lots. My cats breath smells like sardines. This comes and goes. And when her breath smells like sardines, her fur does as well. It makes me want to throw up. Thank you for your tips. I have given her dental treats and ordered some Fruit Stick Matatabi. It’s supposed to help their teeth. I plan to take her to the vets offices to find out what’s going on with her. Hey Nicole, thanks for your message! Yes we totally can relate to this stinkkyyyy breath. We really hope those treats and stick will help her. It might be her food causing her to have indigestion, it’s hard to tell. Your vet will be able to give you some proper indication so it’s a great thing your taking her soon. We wish you the best and thanks again for sharing! Love your description of kitty bad breath,I howled with laughter!my tom cat yawned in my face and I nearly fainted,thus I googled and found your site,love it! Thanks for not going straight to kidney disease!